To partake, just follow the prompt that appears on the GTAV launch screen, or enter by selecting it directly from the Rockstar Playlists in the pause menu. Or make your own Playlist by bookmarking Jobs at Social Club and then creating a Playlist in-game via the Online tab in the pause menu. The proprietors of Warstock Cache & Carry are offering up the whole lot for 50% less all week long. If you're looking to roll in one of their many Off Road vehicles, fly the not so friendly skies in an armed Helicopter or seek and destroy in a Rhino Tank with some bank left to spare, be sure to visit the Warstock site this week. Stuck in a jam? Get by with a little help from the paramilitary experts at Merryweather Security, who are offering 50% off all services through Thursday. Ammo Drops, Boat and Helicopter Pickups, calls to Mercenaries and more are all on markdown. Hang tough in the Karin Armored Kuruma, now 25% off at Southern San Andreas Super Autos. Fast and durable, the Kuruma is perfect for quick getaways and surviving vehicular combat that would send lesser cars to the scrapyard. This week, Ammu-Nation will keep you ready for anything with a nice break on an assortment of gear. Stay protected with Body Armor, or light 'em up with any Assault Rifle and keep your weapons locked-and-loaded with Ammo - all for 25% off. Also included as part of this week's preparedness discount are all Throwables, everything from Sticky Bombs to Grenades, so you can keep your distance and still remain a viable threat. Challenge yourself in the tight and technical "Threading the Needle", this week's Premium Stunt Race in GTA Online. Locked to Motorcycles, this Race is just over 3 miles of track and will require intense focus so crack open a Sprunk and saddle up. 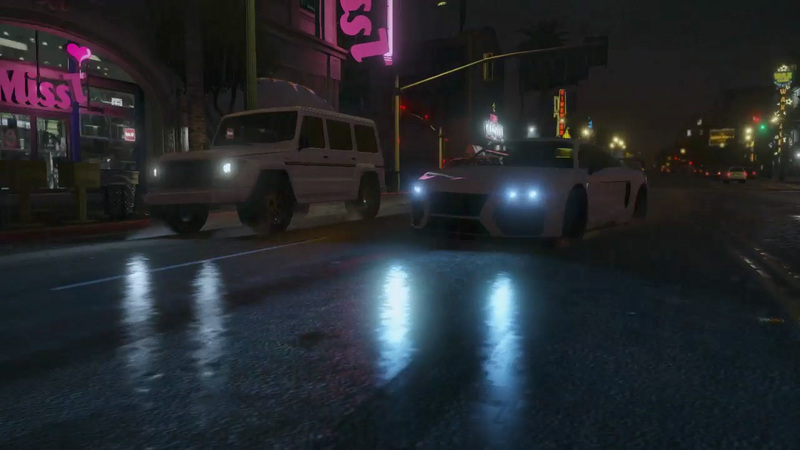 GTA$ payouts await the top three finishers, along with Triple RP for all who enter. Head on over to the yellow Premium Race Blip in Legion Square all this week or enter via the Quick Job App to get your engines revving. 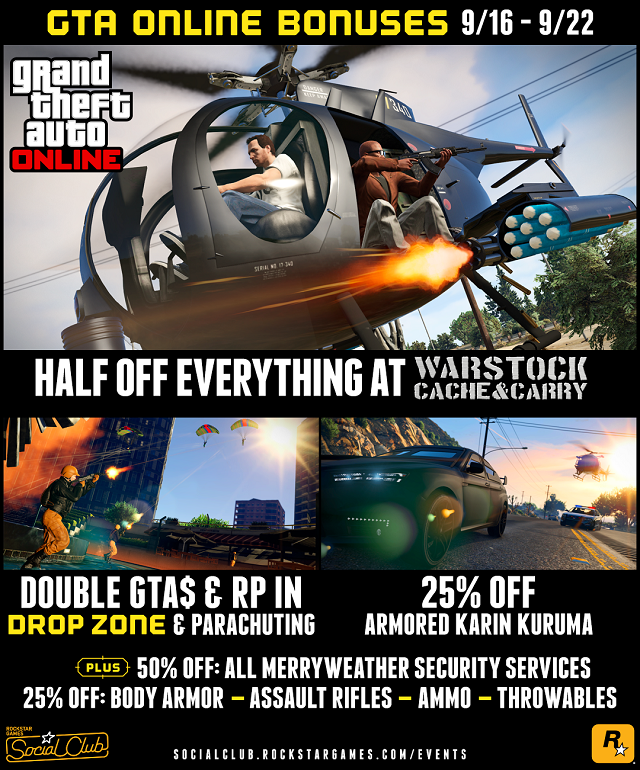 Half Off Warstock & More This Week - This week's new-gen GTA Online bonuses and discounts.